"The continuous pursuit of great health." If you already are a patient with our practice and would like to get access to your information through the patient portal, register here. If you would like to register with our practice as a new patient and create a portal account, register here. North Whiteville Urgent Care and Family Practice is a family practice that is located just off highway 74/76 as you enter Whiteville, NC. Our mission is to provide excellent care to the residents of Whiteville and surrounding areas. Our internist Dr. James Pridgen along with our caring, skilled, and dedicated staff are here to serve you and your family's healthcare needs. Our totally computerized office is an example of our mission to provide state of the art access to healthcare. To join our family, check out our patient portal to request an appointment. 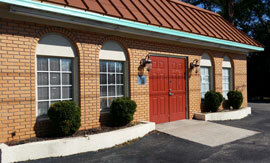 We also accept walk-ins or you can contact us by phone. If you are having a medical emergency, go directly to the nearest emergency room. After hours number for provider on call: 910-350-5910 Please do not call this number for medication refills or for other issues which can be resolved during normal business hours.